PSP-3000 was 3-rd generation Sony’s handheld console. It featured improved characteristics that made this model good seller at the time, though still below exceptions. Later the models with firmware version 5.02 and below have been hacked and modified in the market, which significantly boosted sales of old models. 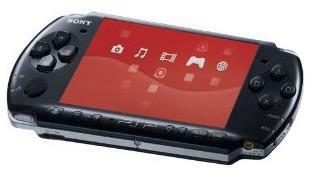 The PSP-3000 is gradually getting less expensive due to a number of reasons including expected release of PSP2. Besides offering the ergonomics and functionality of Slim & Lite, the LCD display’s quality has also been increased to a much higher standard, offering impressive image quality and definitions, especially when the portable console is subject to natural lighting. In addition, the PSP-3000 portable console comes with an integrated mic, enhancing the ways in which you can communicate via products such as Skype and Go! Messenger. The new LCD display offers crisp, clear picture, bringing the full realism out of your game. Combined with a slick and compact shape, the easy and comfortable functions that you’ve come to expect from Sony, and speakers with surround sound capability, the PSP-3000 portable gaming system is definitely the ultimate gaming platform! Communicate with your friends and family members via Skype and Go! Messenger, share audio files, video file, and much, much more! The brand new Sony PlayStation Portable 3000 gaming console — with a large and dazzling wide-screen LCD display, familiar PSP controls, and an integrated microphone is a revolution when it comes to gaming on the go! Watch movies, play some of the best portable games in the world, listen to music, surf the web, and much more! With a unique combination of functions, games, and portability, this system takes the PSP line of mobile gaming consoles to a whole new level! Comes with: One Black Sony PSP-3000 portable gaming console, a battery pack, an AC adapter, and an A C power cord. The PSP-3000 mobile gaming system is all about good looks, superior functionality, and being as portable and convenient as possible. Too bad not everything in life is that way. The 4.3 inch LCD display that the PSP gaming system is equipped with has one of the highest contrast ratios of colors, as well as the fastest response time ever. With Sony’s superior anti-reflection technology, you can play anywhere and any conditions without any obstructions in your view. The integrated Wi-Fi antenna and mic allow you to play online multi-player games and chat at the same time, connect with your loved ones via Skype, and play hundreds of different movies, TV shows, and games on special Universal Media Disks that can be inserted into your PSP portable gaming system with ease. And if that’s not enough, there are thousands more available for download online. Load up your memory stick with tons of free demos, new games, TV shows, movies, and comics from the PlayStation online store, as well as browse the web, listen to the radio, and download pod-casts. If the PSP-3000 mobile gaming system’s screen is not big enough, hook it up to your TV and watch movies and play games on the big screen! PSP-3000 portable gaming system comes with an integrated mic, which is perfect for communicating via Skype and Go! Messenger. Despite the fact that the shape of the console is unchanged, the PSP 3000 mobile gaming system is lighter by 33% and is slimmer by 19% when compared to the original PSP! Reduced loading time thanks to UMD, an advanced feature that stores game data temporarily.